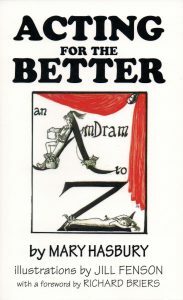 Richard Briers, in his Foreword, says that “This is a splendidly clear and informative guide to becoming a better actor”. Mary Hasbury has worked extensively with both amateur and professional theatre groups, and has written this book so she can share her knowledge. Jill Fenson’s amusing illustrations help make it entertaining as well as informative, for those starting out and seasoned performers alike.